Set in the heart of Paris, this beautiful hotel offers easy access to world-class boutiques in the shopping district, as well as Place Vendome, the Louvre, Paris Opera and Place de la Concorde. Contemporary guest rooms and suites feature marble bathrooms, flat-screen TVs and luxury bedding, with some offering magnificent views of Paris. Relax at the cutting-edge signature spa, work out at the well-equipped fitness center or take a dip in the heated indoor pool. 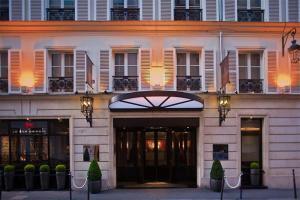 Located close to Jardin des Tuileries and about 18 miles from Charles de Gaulle International Airport.